John Steven McGroarty was born 20 Aug 1862, at the family home at Buck Mountain, in Foster Township, near Wilkes-Barre , Luzerne County, Pennsylvania, the youngest of 12 children born to Hugh and Mary M. McGroarty, both natives of Donegal, Ireland (she from Glenties, he from an adjoining Parish). He was born a month before Lincoln's Emancipation Proclamation freed the slaves. One month before his first birthday the Battle of Gettysburg in his native State orphaned the baby girl who would become his bride. His Grandfather, Neill McGroarty, was born at Inver, Donegal, Ire., Jun 1815 (at the time of the Battle of Waterloo). He eloped with Nancy Mongtomery, niece of General Richard Montgomery of Donegal (friend of George Washington, the first General to die in the War of Independence, at the Battle of Quebec in 1775). In 1832 their youngest child, Hugh, married Mary McGinty (b. 15 Aug 1817); they migrated to America in 1838 with two children, Mary and Bernard. Of the 12 McGroarty children, seven survived childhood: Mary (b. Ireland, 1834, d. PA); Bernard (b. Ire. 1836, d. PA 1883); Bridget (b. ? ?, m. Thomas Farrell); Margaret (b. 1849 or 1850); Catherine (b. 14 Feb 1853 in Buckmountain PA, m. Michael F. McHale 23 May 1874, had five children who survived childhood, d. 16 Jan 1937); Hugh (b. ? ?, many children); John Steven, youngest of the twelve. More genealogical info (posted by Jane McGroarty): Cornelius McGroarty (son of James McGroarty and Susan Harvey) was the grandson of Bryan McGroarty (b. 1774 -d. 1840) and unknown wife. Bryan was the son of Neil McGroarty of the Townland of Kealogs, Parish of Inver, Co. Donegal (b.1746- d.1814) and Peggy Meehan (Meighan). Neil and Peggy had six sons and three daughters. One of the other sons of Neil and Peggy was Neil McGroarty (b. 1780- d. 1815) who married Nancy Montgomery. Their son, Hugh Montgomery McGroarty (b.1805- d.1906), married Mary McGinty and emigrated to Luzerne County, PA. Hugh M. McGroarty and Mary McGinty were the parents of John Steven McGroarty, the poet laureate of Calif. He published his first poem at age 10; he had sent it the weekly periodical, the Boston Pilot, without telling anyone. At age 19 he began his journalistic career with the Wilkes-Barre Evening Leader - one of the new Democratic papers in Pennylvania. 19 Nov 1890 he married Ida Lubrecht, his childhood sweetheart and a school teacher. They were married in her family home. Just prior to his wedding, he was elected Justice of the Peace at age 21. At age 27 he was elected Treasurer of Luzerne County PA, 1890-1893, setting a new age record for that office in Pennsylvania. The City Directory lists him as County Treasurer, 616 Main St., 1891-92. The Copper King, Marcus Daly of Anaconda Copper Mining Co., pursuaded him to serve on his legal staff, and in 1896 he moved to Montana, working in Butte and Anaconda MT. It may be that, legal staff or no, his primary function was running a Butte light company which Daly also owned. Ida McGroarty opened a boarding house for the miners in Butte, apparently in the spring of 1899; 200 men are listed in the account book, which runs about a year. According to his own later account, John abhored the wars between Daly and William Andrew Clark for political control of the state, not to mention the conflicts between capital and labor, vowing to Ida to do something other than "wear a copper collar" all his life. After Mr. Daly's death in the Spring of 1900 he went with some partners to Mexico on a mining venture. They invested all their savings in a scheme which failed. 21 Nov 1901 he and Ida arrived in Los Angeles. He was exhausted and suffering from asthma. Ida put him up in a hotel room and went to work for the Broadway Department Store. The death of the German munitions manufacturer Friedrich Krupp, 22 Nov, inspired John to write a poem, "The Dead Gun Maker", which he sent to the Los Angeles Times, which published it 24 Nov. This led to a friendship with its publisher Harrison Gray Otis; he worked as a journalist and was long the major editorial writer of the Times, doing a column of homey (and later political) comment. author: Just California (1903) The poem was inspired by Teddy Roosevelt's visit, 9 Nov, to San Buenaventura Mission, where he said: "When I come here to California, I am not in the West - I am west of the West - it is just California." The poem appeared for many years in history textbooks of the California School System, and generations of students were required to memorize it. In 1906 he became editor of the Grafton Publishing Company's West Coast Magazine, primarily a vehicle for promoting the beauty and living conditions in the cities of Southern California. He edited the magazine until 1914.
author: CaliforniaIts History and Romance (1911) which went through 10 editions in 13 years. author: The Mission Play (1911), a three hour pageant describing the California Missions from their founding (1769) through secularization and final ruin (1847); involving hundreds of actors, with more than two million paid admissions, the play ran for twenty years at San Gabriel, and was revived for the international exposition in San Diego in 1936. Frank Miller, founder of the Mission Inn at Riverside CA, had seen the Oberammergau Passion Play and wanted a Nativity play for Christmases at the Inn. Stanford University President David Starr Jordan proposed McGroarty as playwright and suggested a theme on California history. Changes in the Illustrated Magazine of the Sunday Los Angeles Times. In the Spring of 1918 is a full page written by him, but without byline (except for a poem in a center box). Under a new format, 2 Mar 1919, McGroarty's name appeared at the bottom of the page. By 6 April the name was printed larger. By 31 Jul 1921 his byline moved to the top of the page. 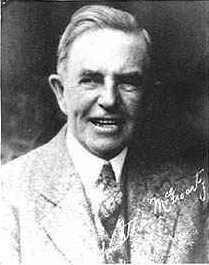 30 Dec 1923 his picture appeared, accompanied by "A Page Conducted by John Steven McGroarty." Finally, 9 Jan 1927, in large caps, his page is given the title "Seen From the Green Verdugo Hills." While he served in Congress his column was often call "Seen From the Capitol Dome." By joint action of the Assembly and Senate of the State of California, he was named Poet Laureate in 1933. He regarded this as his greatest honor. The office is for life. Two poets had preceded him: Miss Ina Collbrith of San Francisco and Henry Meade Bland of San Jose. He went to Congress pledged to support New Deal policies, but left office a strong opponent of them. He opposed Roosevelt's Supreme Court packing plan (5 Feb 37). He was the champion in Congress of the Francis E. Townsend old age pension plan, which would have given everyone over age 60 $200 a month provided they left the work force and spent the money they received. In 1936 he consented to have California delegates to the Democratic National Convention pledged to him for President, but Dr. Townsend opposed this move. He later introduced a "more conservative" version, limited to $100 a month, to be paid for by a two percent tax on transactions. The fight for the Townsend plan is generally agreed to have resulted in creating the Social Security program. In 1937, Congressman McGroarty was influential in getting the Los Angeles County Board of Education to change the proposed "Calvin Coolidge High School" to "Verdugo Hills High School" (see map below). The first VHHS yearbook, El Portal, was dedicated to him. The school auditorium is named for him. Also in 1937, angered over its abuses of native Americans, McGroarty proposed abolishing the Bureau of Indian Affairs (H.J. Resolution 114, January 12, 1937). "He also spearheaded movements for the restoration of Olvera Street and the Missions, the reforestation of the San Gabriel mountains, and the construction of flood control dams throughout Los Angeles county" (Verdugo Online's Poet's Page). John Steven McGroarty died 7 Aug 1944, aged 81, in St. Vincent's Hospital [the same hospital where I, his godson, had been born 27 Dec 1939], Los Angeles CA, attended by a small group of his closest relatives and friends. His funeral Mass was held at St. Vibiana's Cathedral, The Most Reverend John J. Cantwell, D.D., Archbishop of Los Angeles, presiding, eulogy by Monsignor Martin Cody Keating. Interment was in Calvary Cemetary in Los Angeles. On his death "Rancho Chupa Rosa" went, through his will, to his niece, Miss Margaret McHale. In 1953, the City of Los Angeles, Department of Recreation and Parks, purchased the home and 16 acres of adjoining land for only $30,000. The library was restored and dedicated on May 19, 1974, as the John Steven McGroarty Memorial Archive Library. The home, at 7570 McGroarty Terrace, now serves the public as the McGroarty Arts Center under the direction of the City of Los Angeles Cultural Affairs Department. The Cultural Heritage Commission declared it an historical monument on February 4, 1970.